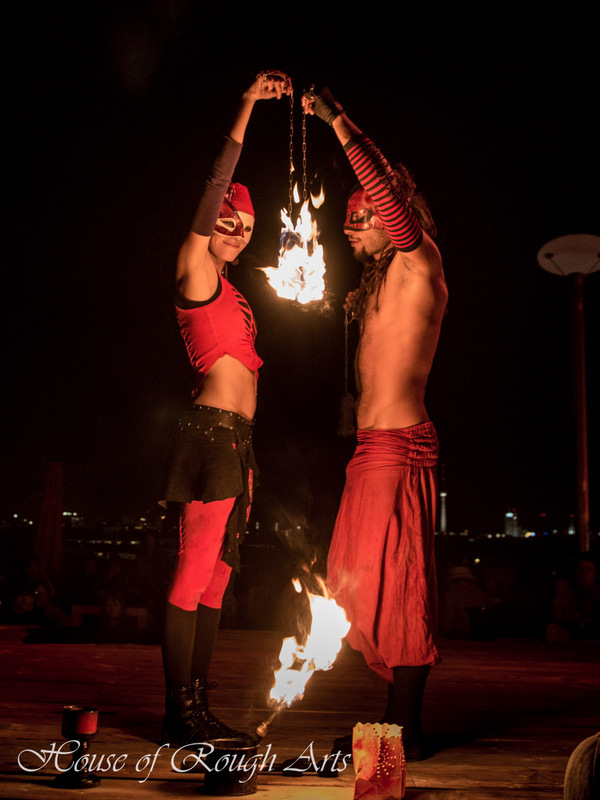 Fuego Rojo weaves together Fire Dance, Acrobatics, Aerial Arts and Original Live Music into spellbinding fables of mystery and magic. Solrak was the first one discovered by Abuelito Fuego, who beckoned the young man to enter his realm of fire. The voice of Abuelito spoke to Solrak and gave him the mission of sharing the beauty of his gift and purifying the souls of the earth with it. Dancing within the sacred flames was a brilliant color, embodying passion, blood, love, madness, strength and heart. Thus, it was the fire from the hands of Abuelito Fuego which ignited the family of Fuego Rojo. Fuego Rojo found its first home on the shores of Playa del Carmen, Mexico, in 2008. Each of the fire artists brought their own characters, harmonies and colours. Together they breathed new life into the art of fire dancing, performing tirelessly and building a reputation for their unique style and dedication. However, Solrak never forgot the mission Abuelito had entrusted him with – to spread the magic of Fuego Rojo throughout the world. First landing in Barcelona, his travels took him across the continent before finally settling in Berlin. Along his journey, three kindred spirits of diverse origins and talents crossed his flight and joined the Fuego Rojo family. The first was Yoka, a beautiful young lady who discovered her magic through the poetry of the wind while flying high on the aerial silks. The fire received her with open arms, bringing her into the spirit of the family and letting her graceful breeze help spread the flames. The pair then met Kninana, who came from the shores of the Pacific and was inspired to help them tell their tales. A few years later Aïssatou joined the tribe. Her dedication and perseverance inspired the family to create an alternative training method: Raknamycs. One could say that Fuego Rojo was born in the hands of Abuelito Fuego, but really, it has always been there. It is inside our minds, inside the vision of our dreams, inside our hearts. It is there like smoldering coal, waiting patiently for Abuelito Fuego’s breath to bring it to life.